The level filler is designed with a sensor probe that shuts off the fill at the desired height. Simply adjust the shelf to the desired height, then place the bottle on the shelf, to set the fill level wanted. The flow is triggered by resting a bottle on the snap switch. The fill will shut off when the sensor detects the liquid hitting the correct level in the bottle. 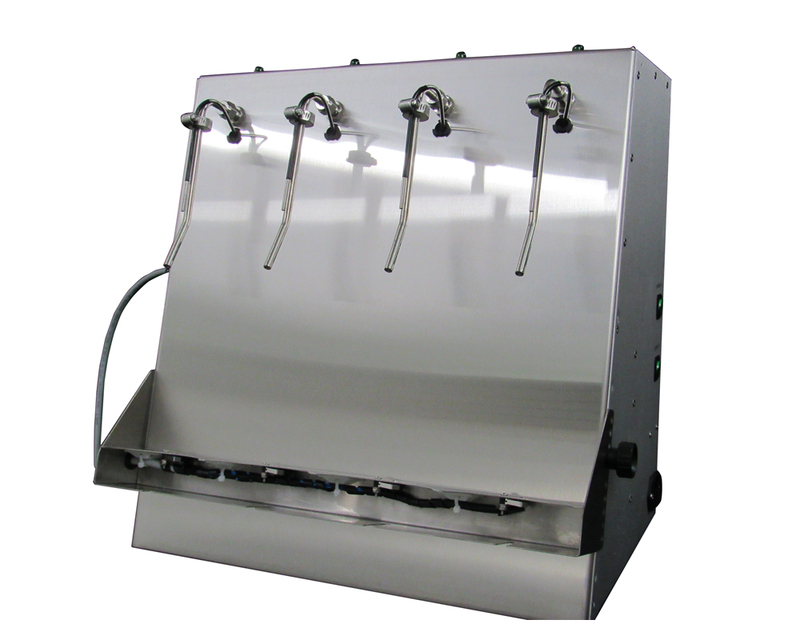 Perfect for use with hand-blown and other specialty bottles that have slight variations in bottle wall thicknesses, punt size, diameter of the bottle, and neck height, among other inconsistencies. They are most popular in industries requiring bottles to be filled to consistent levels even when volumes may vary more than 3%. Industries such as Distilled Spirits must comply with the regulations set by the TTB (Alcohol and Tobacco Tax and Trade Bureau). The Level Fill model is for use with wine, spirits, vinegar and not recommended for oils due to the type of sensor used. Though testing is available for other liquids.